Several commentators, including my recent guest blogger, believe that global warming and climate change are not the problem, but a symptom of our problem. I can't disagree. But I do point out that we no longer have time to correct the underlying problem. We must tackle the symptom (overheating of the planet) head on, or lose the patient. I read a fascinating article the other day, however, about the marketing of a new TV show that pretty much proved to me that there is no hope of saving the "patient." All the time, money, energy, and creative talent going into the marketing of just this one show could have moved the climate change campaign so far ahead, I almost cried. The North American public is being completely manipulated by "marketers" with no sense of responsibility to the greater good. We are being entertainized, consumerized and commercialized to death - nay, to extinction! "The largest threat to humanity's future just may be the consumption of more than necessary. We are caught up in an unsustainable frenzy, spurred by rapid advances in the sophistication, psychology, speed and reach of visual lies designed to convince us we 'need' more stuff than we really do." Those involved in advertising, branding and marketing have a responsibility to be part of the solution because "designers are at the core of the most efficient, most destructive pattern of deception in human history," he writes. 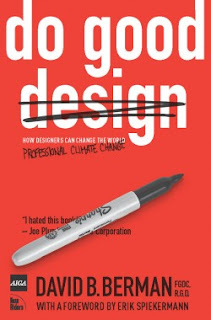 "Designers create so much of the world we live in, the things we consume and the expectations we seek to fulfill. They shape what we see, what we use and what we waste." what could be done to eliminate AIDS if Coca Cola's marketing ability could be brought to serve health in rural Africa. Along with going vegetarian, I think another quick way to become part of the climate change solution is to stop watching TV (and reading ad-filled magazines, newspapers and websites), to stop allowing ourselves to be bombarded with advertising and "programming" and numbed to the climate change emergency and the climate chaos already happening in the most vulnerable parts of the world.